The market scale of LED lighting has continued to grow with the driving forces from the emerging market and the transition of traditional lighting to LED lighting. The expanding market has attracted many companies to join, leading to escalating competition and sliding profit. Many LED companies have thus decided to quit their lighting business or to reorganize their strategies. 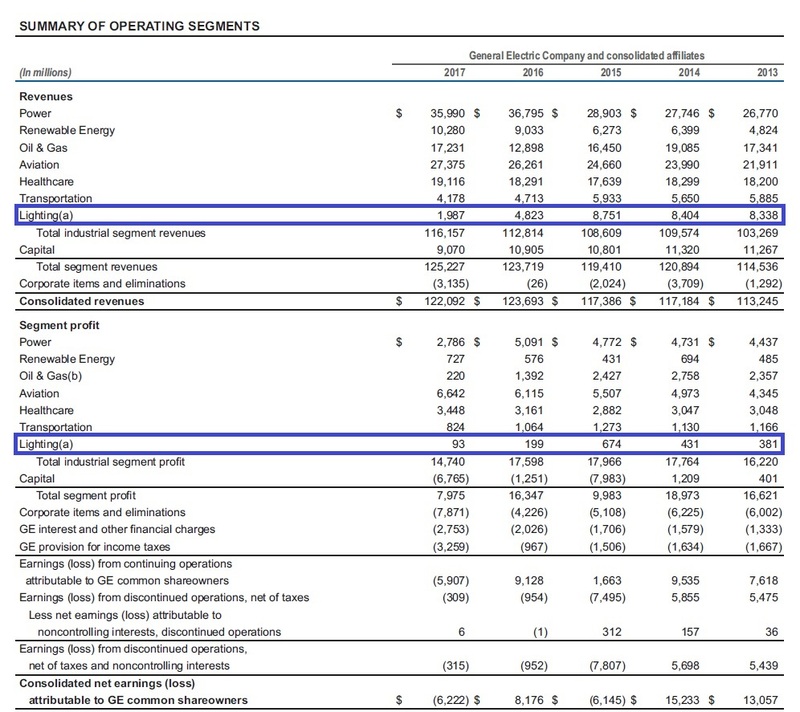 To take a look into the annual report of GE in 2017 which shows the earnings of each segments in the past few year, it is not so surprise to understand why the company has decided to sell its lighting business. The profit margin of GE’s lighting segment from 2013 to 2017 was 4.6%, 5.1%, 7.3%, 4.1% and 4.7% respectively. In comparison with other segments whose profit margin vary from 10-20% in the pass few year, lighting has been the least profitable segment of the company. Since 2018, GE has closed the lighting business in Europe, the Middle East, Africa, Turkey and its Global Automotive Lighting businesses. The company expects to sell the remaining lighting business by the end of the year to complete the transaction. Previously it was rumored that Chinese lighting companies MLS Co. and Foshan Electrical and Lighting Co. might be bidding GE’s lighting business. The rumors might not come true due to the current tensity between the U.S. and China. Aiming to transform its role to a technology company, Osram has been reorganizing its business model and has completed the sale of its lamp business unit LEDVANCE in 2017. By the end of July 2018, Osram has further announced its intention to sell its luminaires business. The annual reports of the past few years also disclosed a reason why the lighting giant decided to divest its luminaires business. The luminaires business of Osram belongs to the segment of Lighting Solution and System (LSS). The earnings of the segment in fiscal year 2014 to 2017* were all negative when first calculated. In 2017, the segment of LSS has lost EUR 72 million (USD$ 83.7 million) despite its revenue of EUR 989 million. The deficit of the segment in recent years indicates that the luminaires business might have eroded the earning of the company. 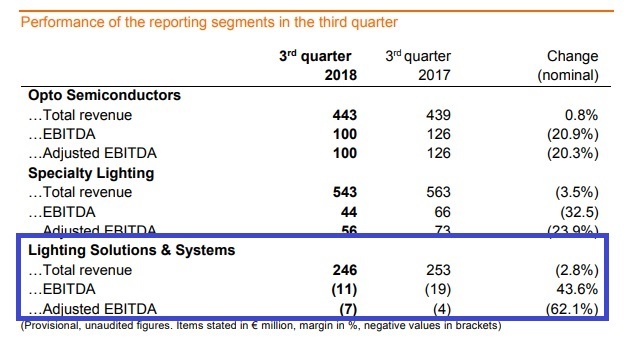 For the third quarter of fiscal year 2018, Osram’s LSS segment still registered a negative EBITDA. The U.S. based LED producer continues to report profits with its lighting products. The lighting products segment is consisted of LED lighting system and lamps. From the annual report of 2017, Cree has maintained profitable with the profit margin of 26-28% in the past three years. However, the gross profit of the lighting products segment has dropped 18% YoY in 2017. Meanwhile, the latest financial report of Cree revealed the company’s profit for its fiscal year 2018**. The gross profit and the gross margin of its lighting product segment have both decreased. Cree has expanded the capacity of its Wolfspeed segment and LED products segment, gradually shifting its focus to businesses with higher margin.